Mortgages can be exciting, and they can be scary. A mortgage insurance is a way to provide peace of mind, because it protects your family from having to pay off the full cost of your mortgage if you die or become disabled. Mortgage insurance is often sold by the financial institution lending the money for the mortgage, but you can also buy it independently. When you buy it through a financial institution alongside your mortgage, it is a product designed to exclusively pay off your mortgage, with all funds going back to the lender. Most lending institutions offer mortgage life insurance as part of their mortgage packaging, but look carefully before you sign on the dotted line. You could find yourself locked into insurance that does more to protect your lender than you. When you buy it independently, you can decide who receives the payout from your mortgage insurance. At a traditional lending institution: The lender owns the policy and the policy is designed to protect the lender. Your insurance is tied to your lender, and cannot be easily transferred when your mortgage is up for renewal. At SafeBridge: You own the policy. You have the freedom to choose your own beneficiary and decide what type of insurance best suits your individual needs. You can switch your mortgage for a better rate at another lending institution without jeopardizing, or having to medically re-qualify for, your life insurance coverage. At a traditional lending institution: You get only one-size-fits-all policies, regardless of your medical history. As a result, your payout can be delayed or you may even be deemed ineligible in your time of financial need. At Safebridge: Your insurance is medically underwritten upfront. This means you will only be insured for an amount you will be eligible for down the line. Any life insurance proceeds are guaranteed to be paid out in a timely manner. It’s about getting the most for your money. At a traditional lending institution: Mortgage insurance coverage decreases as the mortgage is paid down, yet your premiums remain the same. At SafeBridge: Your coverage remains level. In the event of a claim, your premium dollars will provide your beneficiary with guaranteed life insurance proceeds at the same level of coverage as at the time of application. At a traditional lending institution: When your mortgage is paid off, so is your insurance. 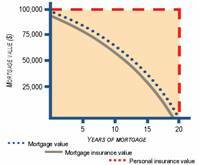 Or you may be cut off from mortgage insurance once you reach a predetermined age. At SafeBridge: Your insurance is designed to suit your needs, and, as part of a life insurance package, can be converted to a whole life insurance policy that can be used by your family to cover costs on your estate. For more information or to find out how much you can save on your mortgage insurance premiums, contact us today.